politics where pugnacious, jingoistic, narrow band nationalism has always lurked. But there is no guarantee of this. A prominent mega-funder of the political left recently told me that he had miscalculated about a number of things in the last election. One of these was that he thought that electorally smashing the increasingly manic right wing that had hijacked the Republican Party and dislodged the more moderate, straight-talking John McCain in favor of the McCain that empowered and unleashed Sarah Palin would produce a more reasonable GOP. For what it’s worth, I think Frum is right and the mega-funder just needs to have a bit more patience. Parties rarely move to the center immediately after a big defeat. Usually it takes two or three before they finally get the message, and on that metric Republicans aren’t due for a move to the center until sometime after 2012. As for the tea parties, they’re nothing new. We’ve seen similar conservative movements flower like clockwork during previous Democratic administrations, and they always burn themselves out after a few years. 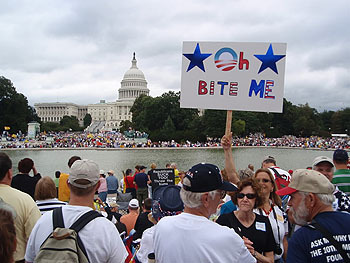 The tea party movement has ascended faster than its ancestors, partly because of lousy economic conditions and partly because of the power of modern media, and my guess is that their fall will be equally swift when it comes. Glenn Beck and Sarah Palin simply aren’t the kind of people who wear well. Their fifteen minutes aren’t up yet, but they will be within a year or two. More on this later.